Last week Elon Musk (of Tesla and Space-X) released his vision for the Hyperloop, a sort of Jetsons/Futurama-style pneumatic tube system for shooting people up the California coast at incredible speeds. I’d sooner squeeze myself into a hamster’s Habitrail than that claustrophobic nightmare, but I do admire the spirit of Musk’s proposal. Knowing he wouldn’t personally be able to execute on the concept, he released his plans to the world in the hopes that someone else would take it forward. But I like it, and I hope you will too. Here’s the elevator pitch: Imagine an Airstream that is impervious to sway or loss-of-control issues, can park itself in a campsite, has huge electrical power capacity, and actually improves your fuel economy when you tow it. It’s possible. 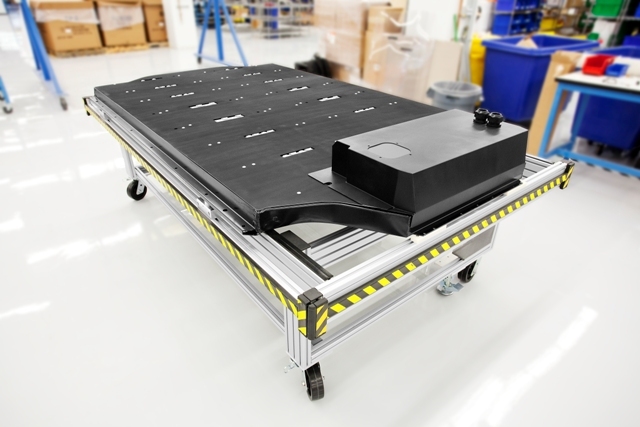 The giant 85 kilowatt-hour (kWh) battery used by Tesla for its ground-breaking electric cars is the key. It’s patented technology but it is based on readily available lithium-ion battery cells that are getting cheaper all the time. 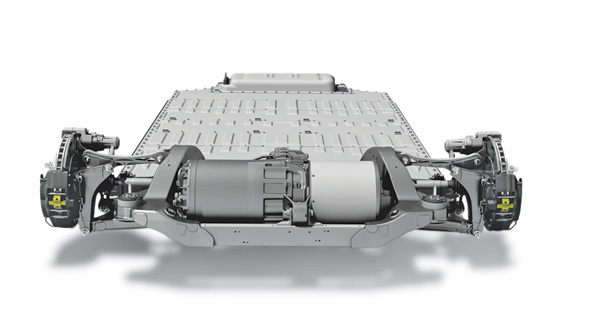 The battery pack is heavy and flat, so it fits in the bottom of the Tesla and lowers the center of gravity. Having a low center of gravity is a big part of the reason why the car handles extremely well and doesn’t want to roll over. Up front, we have a very clever ball coupler that replaces the standard one. This coupler senses the pressure of the tow ball so it can inform a microprocessor whether the trailer is being pulled by the tow vehicle, is coasting, or (going downhill) is pushing the tow vehicle. It’s kind of like a smart surge brake. Sensors at the wheels also provide information about the direction of travel, by measuring the difference in wheel rotation. All of this 21st century cleverness means that when the Airstream is being towed in a straight line, and the tow vehicle is pulling hard, the Airstream can contribute some power. Not enough to push itself out of control, mind you, but just enough to help compensate for the natural aerodynamic resistance of the Airstream, and thus restore some MPGs to the tow vehicle. So perhaps your 20 MPG truck gets 20 MPG even when towing, instead of 10 MPG. That would be nice. When turning, backing, or coasting, the Airstream would act like an ordinary trailer, just spinning its wheels. When slowing or stopping, the regenerative brakes would put a little power back into the big battery. Those brakes would be plenty strong and much more reliable than standard trailer electric drum brakes. Now, a “smart trailer” like this would know if it was swaying or otherwise misbehaving, and it would be independently capable of correcting it. Say goodbye to sway problems forever. Likewise, it would be able to stop itself very smoothly if the coupling came loose, or the breakaway switch were activated. When you get to camp, there’s another really nice perk. Disconnect the trailer at a convenient spot and then use a handheld remote control to self-drive the Airstream right into your campsite, or a parking space. This may seem science fiction, but in fact this technology is already in use in Europe with the Reich Move Control (start watching the video at 5:16 to see an Airstream doing this). No more need to stress out over backing up the trailer into a tight spot. Recharging is no problem at all. If the campground has electricity, plug into the 50-amp connection and the battery should regain about 30 miles of range for every hour you are camped. One overnight stay, and you’re charged up for another day of power-assisted towing. Or, if you haven’t used up the battery pack during towing, it’s a huge house battery. The standard pair of wet-cell batteries in an Airstream provide less than a kilowatt-hour of usable power. The Tesla battery holds 85 times as much! This system could even enable a sort of “Holy Grail” for people who really want to make RV’ing “green.” You could potentially tow a self-powered Airstream a couple hundred miles using an electric vehicle such as the upcoming Tesla Model X. Zero petroleum, zero emissions, and a free recharge at night while you camp. On a typical 200-mile tow that’s a cash savings of about $60-85, more than enough to pay for a really nice campsite. Of course, the campgrounds might get wise to this someday, and charge an electric surcharge. I wouldn’t be surprised, but still it’s much cheaper to “fuel” an electric vehicle than any fossil-fueled vehicle. This idea is definitely half-baked. There are huge cost issues here, no question. The battery pack alone would be in the $10-20k range. Right now nobody in the RV industry is going to explore this because they know that nobody will buy it. Also, there could be drastic regulatory issues. Does a trailer change classifications with the Dept of Transportation once it is self-powered? What sort of regulatory barriers might exist? I haven’t looked into any of that. So I humbly present this idea to you, solely to spur your thinking. Realize that the way we do things today will change. Someday our practice of driving fume-belching trucks pulling “dumb” trailers will be as much a part of our past as steam locomotives. Somebody is going to reinvent the RV’ing industry, when the time is right, and I just hope I’m here to see it. In fact, I want to be part of that future, so if anyone is planning to do some work with this idea, please bring me in as a consultant. I want to be the first guy to go on an all electric camping trip, 200 miles from home with my “smart” Airstream trailer. Don’t you? I’m in my last week as TBM. This weekend I’ll be riding a Boeing back to New England, and then driving up to Vermont to regroup with the family. This year my TBM experience has been a bit of a bomb. I lost too much time to illness, work, Alumafandango, and obligations at the house. I had great plans to go for a tent camping roadtrip, which clearly is not going to happen now. But don’t feel too sorry for me, because in September the entire family will be back in the Airstream and towing west, with a full month to burn if we want to. It will be our last chance for a long leisurely family roadtrip for several months, if not a year, so we are planning to make the most of it. I never thought that would happen. Are we getting too jaded, too experienced, or are we just not trying hard enough to broaden our horizons? I think it may be the latter, so I am re-doubling my efforts to seek out the little things instead of the big ones. To that end, Eleanor and I are planning to follow a pattern we used when full-timing: have a long term destination (like home base) in mind, and then take the trip day by day. This leaves lots of opportunities for the unexpected, and often that’s when the most interesting adventures occur. The process has already started in a sense. In the past week I have been contacted by three Airstream friends, each of whom—completely coincidentally—is likely to cross our path as we head southwest. Just spending a day or two with each of them is likely to result in some new experiences. Think of it as Airstream cross-pollination. We get a taste of their style, and they get a taste of ours, and together we discover things that individually we might miss. It’s always a good thing. So when we head out, our route will be affected by the routes of other Airstreamers, and we’ll go places we might have skipped. This is tough on fuel budgets, but to be on the safe side I’m planning for about 3,300 miles of towing, which means a fuel budget of about $1100. Seems like a lot but for a month of roaming I think it’s a bargain. Eleanor is already thinking about getting the Airstream in shape for the trip. She’ll be cleaning the interior and stocking up on supplies; I’ll be checking all the systems and cleaning the exterior once I’m there. Everything should be in good shape, but after a summer of sitting still amongst the trees and insect life of Vermont, you’d be surprised what little problems can crop up. I’ve learned to start checking at least a week before any major trip, just in case I find a problem that requires a parts order or a trip to the local RV service center. The Safari, by the way, will celebrate its eighth year on the road with us in October. I have lost track of the miles it has traveled, but it is certainly above 100,000. I can’t think of any other purchase we have ever made that has given us such a great return, in terms of life experiences and pleasure. When it’s not our home on the road, it’s a great guest house. People talk about houses as “investments,” and RVs are just “depreciating assets” but I have to disagree. Our house is worth about 2/3 of what we paid for it (not counting the cash dumped into fixing it up), and it costs many times more to keep running than our Airstream. It’s a nice house, but in the end it’s just a house. Our Airstream is probably worth about half of what we paid for it, but it has changed our lives and enriched us in ways we can hardly enumerate. So by my accounting, the Airstream is the bigger bargain by far, and we will once again prove that in our month-long saga with our recently-minted teenager. She still wants to spend time with her parents, and I think some of the credit for that can be given to the Airstream as well. Going out this fall will remind us all of those precious years (2005-2008) that we spent full-timing with Emma, and I bet we’ll all want to recreate a little of that magic as we roam westward. I hope so. Thinking of it that way, I realize it doesn’t really matter where we stop along the way. The memorable moments will happen. We just have to get out there and let them come to us, with our Airstream to keep us comfortable along the way. The blog has been quiet lately, and I’m sure a few people are wondering what hole I’ve managed to fall into. A friend once accused me of being a compulsive blogger, needing some sort of intervention and a 12-step program, but none of my friends seemed to care to stop me. So what has kept me quiet for so long lately? I have to put “work” in quotes because I can’t honestly use that term to describe the herky-jerky progress I was making for the first two years, interspersed by long period of contemplation and (let’s be honest) distraction. Like the massive jigsaw puzzle, I had found all the easy parts and put them together, leaving a giant framework with 4,900 pieces yet to go. This was a motivation-killer. But it’s harder to abandon a project of one’s own design. After all, who or what can you honestly blame for the failure? It was a jail of my own making and I’d told too many people about it, so I kept plugging away, adding a figurative puzzle piece every week or two, and then suddenly a wonderful thing happened. It was that magical moment known to all writers of long texts and jigsaw puzzle fanatics alike. I could see for the first time the beautiful picture that my puzzle would eventually form. Better yet, it was all so obvious now. I knew exactly what I needed to do, and without any motivational struggle at all I found myself gleefully opening up the document and adding text at every opportunity. Suddenly I was finding time to write after dinner, before breakfast, between phone calls. The first day after the breakthrough I added three pages of text to a 30 page document. The next day I added five pages. The next, 10 pages. By the end of the week the project that took over two years to grow to 30 pages had doubled in size to 60. It was almost worth waiting two years to have that experience. Breakthroughs like that feel great. Alas, my next act was to get sick with a virus, which has cost me a week of productivity already and will probably take another week to clear up fully. I stopped working on the book because it took all of my virus-limited brainpower to just keep the basic operations going (keep in mind, I’m still TBM so I’ve got to do things like grocery shopping and laundry in addition to moving the Winter issue of Airstream Life ahead). Now, I’ve got to fly up to Oregon to help Brett run Alumafandango, so there’s another big hiatus in the book project ahead.